Hair removal creams are a quick and easy way to remove unwanted hair, but do they really work? This Nair hair removal cream review will examine in detail the experience of using one of today's most popular brands of depilatory cream. Nair depilatory cream has been around for more than 15 years, and that longevity lends credibility to its reputation. The product claims not only to remove hair in as little as three minutes, but also to exfoliate skin and moisturize for a thoroughly glowing result. 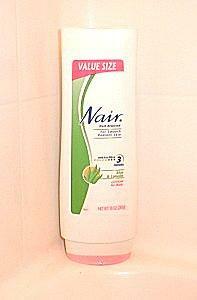 Nair is available as a creamy lotion, a mousse, and a roll-on applicator. Other Nair products include bleaches and waxes to meet everyone's hair removal preferences. Nair products can be used on any unwanted body hair, including legs, armpit hair, bikini areas, and face as desired, though less mild formulas are provided specifically for the face. This Nair hair removal cream review focuses on the company's most popular product, the classic lotion used on leg hair. The cream comes in a variety of scents, including aloe, cucumber melon, and raspberry, and averages $6 for a 9-ounce bottle, which is suitable for 3-5 leg applications depending on the total surface area to be treated and the type of hair to be removed. To use Nair cream, it is important to follow the recommended application instructions. Before a full treatment, test a small area to check for potential allergic or uncomfortable reactions, even if you have used the product successfully in the past. When applying the cream, it is wise to soften hair beforehand for the best results: this can easily be accomplished by using Nair after a bath or shower. The instructions recommend applying a thick layer - this is critical because a thin layer will not have as effective of results and hair removal may be spotty with an uneven layer. As the cream sits, the treated area will begin to tingle and feel warm. This is normal, but if it becomes painful or feels like an intense burning, rinse the cream off immediately. After the recommended three minutes, test a small patch to see if it has been effective. Thicker, coarser hair will need to sit longer - even up to ten minutes, but no longer or a rash or other irritation may result. When removing the cream, wipe it off firmly in downward strokes in the direction of the hair growth. Using a washcloth is the best option because the coarse texture of the cloth will help detach the hair. At the same time, however, do not scrub the skin because that could cause additional irritation. Be sure to rinse skin thoroughly so all traces of depilatory cream are removed. Spotty hair removal if the cream layer is uneven or not thick enough. Redness or rash, particularly for sensitive skin or if the cream is left on for a long period. Dark spots just beneath the skin (remnants of hair). Slightly longer-lasting results, giving users smooth skin for a day or two longer than shaving. Smooth skin without the dryness that may accompany shaving. Unpleasant or irritating smell despite fragrances; smell may remain even after legs are rinsed repeatedly. A Nair hair removal cream review will vary for every individual who uses the product. People who may have the best results include individuals with light hair who may not mind spotty removal, or those with fine hair that can easily be removed in a short period of time with the cream. On the other hand, certain individuals will not have as positive of results, including people with very coarse hair that may not be removed effectively or individuals with sensitive skin that could react adversely to the harsh chemicals in the depilatory cream. Nair hair removal cream is one of the beauty industry's longest lasting depilatory products, but that does not mean it is suitable for everyone. For more information about Nair products, visit any general retailer (the products are available at most drug stores and discount stores), or visit NairCare.com.